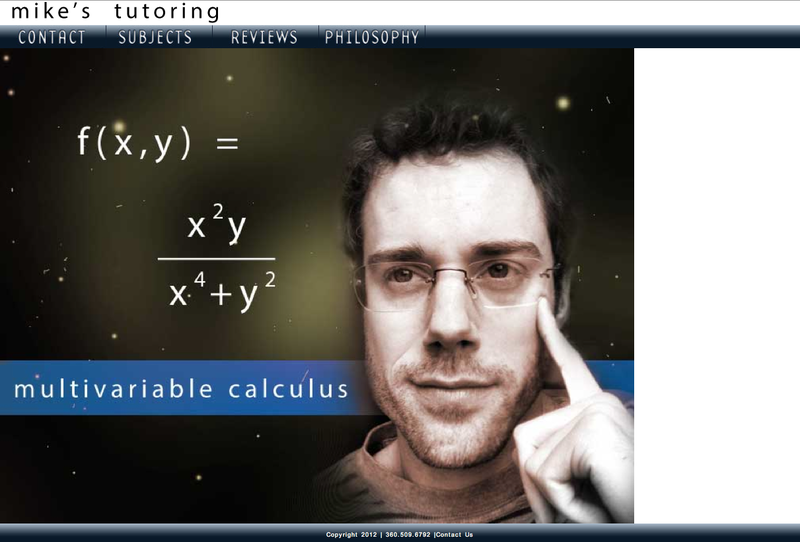 Mike’s Tutoring Website. I spent most of today trying to make my jquery slideshow work. How it actually did, I am not sure. (What a tangled web of files, I did weave.) I tried to download some files from the internet, but it didn’t seem to work. I kept seeing my slideshow as a static image and you can imagine how annoying that is. I ended up making a copy of my last project and cleaning out all of the styling but leaving the linked up js, css, etc. in tact. This morning I designed the slides for the jquery slide show. My client (Mike of Mike’s Tutoring) did not want his photo on the internet during the design phase. I am pleased to be working with up and coming model Dan H. There’s still some reworking to be done. I’m going to add more copy on the right where that whitespace is now. This site also has CSS sprites which gave me considerably less problems. I validated my site and had a couple of errors. The source: unclosed tags and the like. I will be working on adding more pages, styling the mobile versions and finessing the design.